Love pizza? 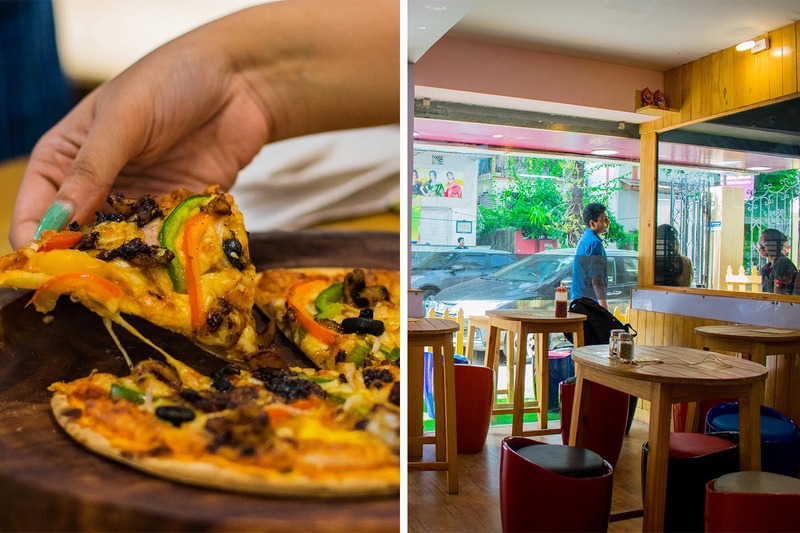 Hit up the newest pizza chain in Kolkata, Who said Pizza?, for fresh, woodfire oven pizzas with imaginative toppings. Started in January this year with an outlet in Golpark, Who Said Pizza has now three more outlets in Southern Avenue, Kasba and Behala. And they must be doing something right – as folks are lining up outside for their woodfire-baked, thin crust pizzas. We went down to their Southern Avenue outlet opposite Xrong Place. They had loads of options but we decided to go for the unconventional ones. The first one to our table was the smoked, grilled bhetki pizza. Now that’s something that you might have never had before. The bhekti smothered in cheese kept us asking for more, but the tomato sauce base could have been better. If you like squid, we recommend the squid Schezwan pizza beautifully grilled and mixed with other toppings. Every bite is a treat! They have great vegetarian options starting from mushroom and babycorn to basic paneer, and even fruits! End your meal with the chocolate mousse or the brownie (though it was a tad slimy). All their outlets, including this one is small ( 15-20 seater), yet neatly spaced. You can clearly see the kitchen (and the wood fire oven) and the pizzas being freshly prepared right in front of you. The pizzas here are light so two people can easily polish off a large size for lunch. Though thin crust is their forte, they also make soft bread-base pizzas. They have offers from time to time – for instance, if you order two medium or large pizzas, the second one will be on a flat 50% off! And they also take party orders. Price for two: About INR 400 (they’re not charging taxes, yet).